The history of tea in China is long and complex, for the Chinese have enjoyed tea for millennia. Scholars hailed the brew as a cure for a variety of ailments; the nobility considered the consumption of good tea as a mark of their status, and the common people simply enjoyed its flavour. In 2016, the discovery of the earliest known physical evidence of tea from the mausoleum of Emperor Jing of Han (d. 141 BCE) in Xi'an was announced, indicating that tea from the genus Camellia was drunk by Han Dynasty emperors as early as the 2nd century BCE. Tea then became a popular drink in the Tang (618–907) and Song (960–1279) Dynasties. According to legend, tea was first discovered by the legendary Chinese emperor and herbalist, Shennong, in 2737 BCE. It is said that the emperor liked his drinking water boiled before he drank it so it would be clean, so that is what his servants did. One day, on a trip to a distant region, he and his army stopped to rest. A servant began boiling water for him to drink, and a dead leaf from the wild tea bush fell into the water. It turned a brownish color, but it was unnoticed and presented to the emperor anyway. The emperor drank it and found it very refreshing, and cha (tea) came into being. Lu Yu's statue in Xi'an. The Erya, a Chinese dictionary dated to the 3rd century BCE, records that an infusion of some kind of leaf was used as early as the Zhou Dynasty (1046–256 BCE). While historically the origin of tea as a medicinal herb useful for staying awake is unclear, China is considered to have the earliest records of tea drinking, with recorded tea use in its history dating back to the first millennium BCE. The Han Dynasty (206 BCE–220 CE) used tea as medicine. The use of tea as a beverage drunk for pleasure on social occasions dates from the Tang Dynasty (618–907 CE) or earlier. The Classic of Tea (《茶經》) by the Tang dynasty writer Lu Yu (陸羽)(729-804) is an early work on the subject. (See also Tea Classics) According to Cha Jing writing, around CE 760, tea drinking was widespread. The book describes how tea plants were grown, the leaves processed, and tea prepared as a beverage. It also describes how tea was evaluated. The book also discusses where the best tea leaves were produced. At this time in tea's history, the nature of the beverage and style of tea preparation were quite different from the way we experience tea today. Tea leaves were processed into compressed cakes form. The dried teacake, generally called brick tea was ground in a stone mortar. Hot water was added to the powdered teacake, or the powdered teacake was boiled in earthenware kettles then consumed as a hot beverage. A form of compressed tea referred to as white tea was being produced as far back as the Tang Dynasty (618–907 CE). This special white tea of Tang was picked in early spring, when the tea bushes had abundant growths which resembled silver needles. These "first flushes" were used as the raw material to make the compressed tea. Tea is an important item in Chinese culture and is mentioned in the Seven necessities of (Chinese) daily life. Tea was also used as a relaxing therapy for the Chinese. In 1753, Linnaeus described the plant as a single species, Thea sinensis. Later, however, he recognized two species, Thea Bohea and Thea viridis, as cultivated in China, and it was long thought that these were the origin of black and green tea respectively. 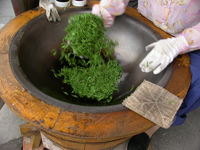 Steaming tea leaves was the primary process used for centuries in the preparation of tea. After the transition from compressed tea, the production of tea for trade and distribution changed once again. The Chinese learned to process tea in a different way in the mid-13th century. Tea leaves were roasted rather than steamed. This is the origin of today's loose teas and the practice of brewed tea. 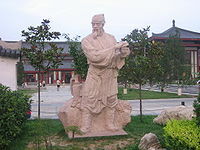 Lu Yu wrote in the Classic of Tea or Cha Jing (茶经), "Tea as a beverage originated with Shennong." 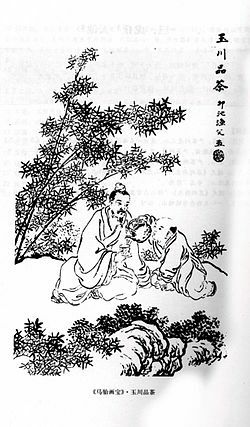 The medicine book entitled Shennong Ben Cao Jing (神农本草经) stated that "Shennong tasted hundreds of herbs, he encountered seventy two poisons daily and used tea as an antidote"
In Chinese legend, Shennong died in Tea Hill (Chaling County), Hunan. In 760 CE, Lu Yu already noted: Tea is a grand tree from the South, tall from one, two, and up to several dozen Chi. Some with circumference up two meters (6.6 feet). In 1939, botanists discovered a 7.5 meter (24.6 feet) wild tea tree in Wuchuang county of Guizhou province. In 1940, on the Old Eagle mountain of Wuchuang county, a 6.6 (21.7) meter tall wild tea tree was discovered. In 1957, a 12-meter (39.4 feet) wild tea tree was discovered in Cheshui county of Guizhou. In 1961, a one thousand seven hundred year old, thirty two meter (105 feet) tall and more than one meter (3.3 feet) wide wild tea tree was found in the rain forest of Yunnan. This is the king of tea trees. In 1976, a 13-meter (42.3 feet) wild tea tree was found on Daozhen county, on a mountain at 1400 meter (4600 feet) elevation. More wild tea trees were found in the mountains of Sichuan, Yunnan, and Guizhou provincies, many of them more than ten meters tall. Tea was called 'tu' (荼) (in the Chinese ancient classic Shi Jing (The book of Songs)). Tea was also called 'jia' (檟) in the ancient Chinese classic Er Ya compiled during the early Han Dynasty: " Jia is bitter tu". The word tu was further annotated by a Jin scholar, Guo Pu (276–324 CE): "Tu is a small plant, its leaves can be brewed into a beverage". Tea was also called "She' (蔎) in a West Han monograph on dialect: Fang Yian. During the Han Dynasty, the word tu took on a new pronunciation, 'cha', in addition to its old pronunciation 'tu'. The syllable 'tu' (荼) later developed into 'te' in the Fujian dialect, and later 'tea', 'te'. 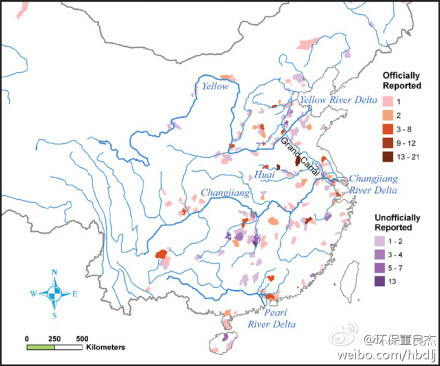 The syllable 'she' (蔎) later became 'soh' in Jiangsu province, Suleiman's 'Sakh' also came from 'she'. The syllable "jia' (檟) later became 'cha' and 'chai' (Russia, India). During the Sui and Tang dynasties, drinking tea became a widespread custom, then spread west to Tibet. The first use of the word 'cha' instead of 'tu' for tea was in Lu Yu's Cha Jing, The Classic of Tea of 760 CE. From the historical annal "Yianzhi Chunchiu": the prime minister of Chi (547 BCE–490 BCE) had egg and tea food on his table. Xia Zhong's Treatise on Food : "Since Jin dynasty, the people of Wu (now Suzhou city) cooked tea leaves as food, and called it tea broth". In the Song Dynasty, tea was a major export good, through the Silk Road on land and Silk Road on the sea, tea spread to Arab countries and Africa. Some historians believe Marco Polo encountered tea in his travel. Other historians point out that his writings fail to mention tea at all. In 1559, Giovanni ta Ramusio mentioned "chai" in "Delle Navigatione et Viaggi", Vol 6. Modern-day white teas can be traced to the Qing Dynasty in 1796. Back then, teas were processed and distributed as loose tea that was to be steeped, and they were produced from "chaicha", a mixed-variety tea bush. They differed from other China green teas in that the white tea process did not incorporate de-enzyming by steaming or pan-firing, and the leaves were shaped. The silver needle white teas that were produced from the "chaicha" tea bushes were thin, small and did not have much silvery-white hair. It wasn't until 1885 that specific varietals of tea bushes were selected to make "Silver Needles" and other white teas. The large, fleshy buds of the "Big White", "Small White" and "Narcissus" tea bushes were selected to make white teas and are still used today as the raw material for the production of white tea. By 1891, the large, silvery-white down-covered Silver Needle was exported, and the production of White Peony started around 1922. The first tea monograph Cha Jing by Tang dynasty writer Lu Yu was completed around 760 CE. This is more than four hundred years earlier than the first Japanese tea monograph by Eisai No known ancient Indian monograph on tea exists. There were about one hundred tea monographs from the Tang dynasty to Qing dynasty. This treasure about tea culture is only beginning to attract the interest of western scholars. ^ Gray, Arthur (1903). The Little Tea Book. The Baker & Taylor Company, New York. ^ P.O. Owuor and I. McDowell (1994). "Changes in theaflavin composition and astringency during black tea fermentation". Food Chemistry. 51 (3): 251–254. doi:10.1016/0308-8146(94)90023-X. ^ Helen Saberi (2010). Tea: A Global History. Reaktion Books. p. 185.
, "Tea, its history and mystery"
, "The empire of tea: the remarkable history of the plant that took over the world"
, "Tea: a global history"
This page was last edited on 6 February 2019, at 23:58 (UTC).